The guys peeked in the bakery window as I finished the final touches on my super duper baked apple treats – a traditional German Christmas dessert. Frank: Hmmmm…they look pretty good! Mike: Yah. And they smell good, too. Carol: Hey guys! I’m finished! Are you ready to try my very own version of Brataepfel? Mike (frowning): How do I eat this? Also, this is a baked apple. This isn’t a treat! Carol: I used a knife and a spoon. Mike: Why is there glue on top of it? Carol: It’s not glue! It’s vanilla sauce. Frank: I like that you used cashews and raisins in there, though. That’s tasty. Frank: This vanilla sauce looks like glue and tastes like nothing. I’m sorry, Carol, but this treat is a bust. It doesn’t even taste like vanilla. Or sugar. It actually tastes like nothing. This prototype baked apple needs a lot of work. Mike: Here, you can have mine. Baked apples aren’t my style. Actually, maybe Tooter would want this. Carol (glumly): Well, it’s back to the drawing board. On second thought, baked apples aren’t really a food Santa could take away easily – it’s a sit down snack, not a eat-on-the-run snack. Frank: Why don’t you two go for a walk? I’ll clean up the kitchen and try some other recipes. Carol: Thanks, Frank. That’s a good idea. Mike: Hey, you want to go see the people skating at the ice rink around the corner? You can take pictures of people skating! Maybe we’ll see a hockey player! Carol: Woohoo! 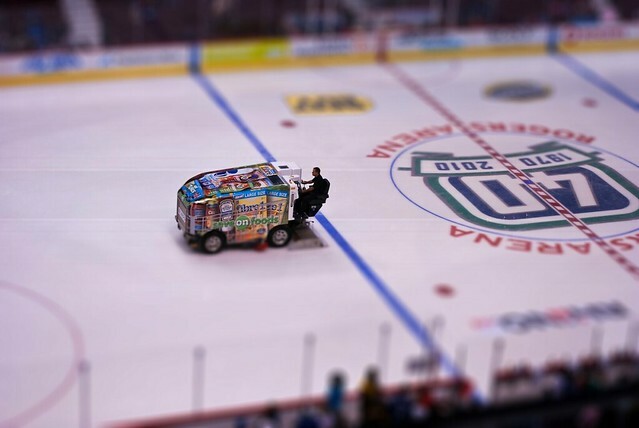 Tiny Zamboni time! Mike: And guess what else it’s time for? Retro skating night! Look! It’s Lisa and her boyfriend, Dale! Carol: Hey Lisa! Hey Dale! How are you guys? I didn’t know you turned the ice rink into a skating disco at night! W00T! Do you take requests? Will you play Born to Be Alive? How about YMCA? VILLAGE PEOPLE YAH! Lisa: Hi Carol and Mike! We love Disco night at the skating rink! We’re the MCs and DJs couple of nights a week. Did someone say Born to be Alive? We will play it next! CAN YOU DIG IT? I KNEW YOU COULD! The ice rink came alive with people skating and doing The Hustle and The Bump. It was a 70’s revival! Carol: Hey look! That guy in the red pants just did a face-plant in the snow bank! I just took his picture. Ha! Mike: Nothing like a little Schadenfreude to cheer you up! The night just got better and better after that. This entry was posted in Festivities, General and tagged 70's revival, advent, ice rink, Schadenfreude, skating, try try again, Zamboni in tilt shift. ← Advent story, day 6 – How about them apples? Gosh – do you really live within walking distance of GM Place? As a rabid Canucks fan living a VERY long way away (on a different continent), I couldn’t be more jealous! Wow. Schadenfreude and Zamboni in the same post. Your scrabble scores must be magnificent! Well. I am sorry the baked apples did not turn out as planned. That is a bummer. I now know about Schadenfreude. Good. I wish Frank would clean up my kitchen. That blonde doing a back bend with one foot up makes me nervous.